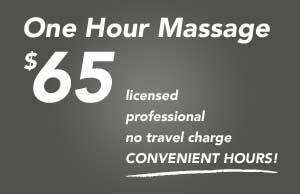 Experienced Mobile Massage brought to you in the comfort of your home or office. Trinity Mobile Massage is located in Denver Colorado. I happily have been in business since May, 2005. This is in thanks to the support of my clients and those who are soon to be. I believe in bringing only the best in seated massage therapy to your office and Thai or table massage therapy to your home or hotel room. My massages will benefit you in various ways, such as providing stress relief or reducing aches and pains caused by injuries of many kinds, including auto accidents. All you need to do is relax. I bring all of the equipment necessary for the styles of massage I offer, such as the massage chair, Thai mat or table, along with all the linens, towels, massage lotions and music if needed. If you have never experienced chair, Thai or table massage, read my FAQ (frequently asked questions) page for a description of some experiences you may have. I am currently serving the following areas, Longmont, Greeley, Fort Lupton, Brighton, Broomfield, Thornton, Westminster, Platteville, Frederick, Firestone, Dacono, Hudson, Erie and Henderson. Need relief of pain due to a recent auto accident? Did you know that you could receive Massage therapy as an option to get relief from your pain with the potential of not having to pay for it? Call today to find out how. 720-434-6603.